The Marshall Islands and their Sea Level Changes | Watts Up With That? A rising tide doe not lift all boats after all. Subsidence in places like New Orleans and Venice has been attributed to pumping out fresh water. How much have these islanders been pumping relative to the size of their freshwater lens? So,another “figures don’t lie but liars figure”? And what exactly explains the 0.22 metre changes in a single year? For answers refer to the wonderful work of Bob Tisdale. Rule out winds before ruling in subsidence. These aren’t the rise you’re looking for. Are there hills on the ocean’s surface that are getting higher? When the land level drops, does the sea level rise there relative to everywhere else? I suspect some alarmists will answer “yes” to both questions. Kwajalein was the home for many years of a sizable contingent of workers from Lincoln Labs and perhaps other denizens of the military-industrial complex. They were working on ABMs and occasionally, I think, (probably classified), there was a shoot targeted near Kwajalein with an attempt to bring down the missile. There were schools, libraries, etc built, no doubt wells dug, etc. So depending on how the sea-level rise was measured, perhaps it is more of a ground-level subsidence due to extensive building. New Orleans and Venice were both built on deltas. Both are subsiding due to sediment compaction and crustal loading. Isostatic balance and rate of compaction will determine their future. Unless Kwajalein has artesian wells, the water gradient is normal hydrostatic and not supporting the overburden. Pumping out the water will have no effect on the surface elevation. according to that, the tropical indo-pacific is now almost 2 feet higher than the rest of the ocean…. If that doesn’t work out, they are buying that deep valley off Maine…. It looks like another data revision effort is about to begin–on anything that contradicts. Hank Johnson (D) Ga. wants to know if any Marines have been moved to Kwajalein from Guam! Some of ‘our’ ships [we manage them – they’re expensive; we don’t own them!] are registered in Majuro, MI. If Majuro sinks, will they be able to carry more cargo – or less – before their load line is submerged? You should compare Kwajalein to the POPOVA (BELYI OSTROV) station at the tip of the Yamal Peninsula because sea level, tree rings and temperature change should all correlate. If you note the time line, the “rise” corresponds to the Navy and Air Force development. It likely is “just like the Maldives” as described in a recent article (on this site if I recall correctly). It’s more believable Kwaj is sinking by US Government work than the Pacific Ocean deciding to selectively rising around the Marshalls. Maybe it’s that missing heat expanding the water around the Marshalls? Kwajalein is a seamount atoll. An atoll formed on top of an extinct volcano. You can think of the volcano as a big pile of rubble that settles over time, lowering the surface of the atoll. Kwajalein Atoll is also the terminal point of a US missile test range. I imagine that there is a lot of construction there. I salute Nils-Axel Mörner one of the many great scientist fighting Global stupidity. Scepticism alarm bells should ring loudly on anyone who sees an accelerated sea level rise in one location alone. How anyone could point to that and think and say “global warming” is truely beyond me. The US military and civilians on the island of Kwajalein use stored rainwater as their water source. The island is pretty well built up, I doubt there has been much additional construction this century. If there is an explanation for the sea level change it is probably due to a shift in the prevailing winds. Another possibility is that the local currents have been disrupted when the Marshallese on the neighboring island of Ebeye filled in the shalllows in the process of connecting two smaller islands to Ebeye. If too many people rush over there to measure and speculate , the island could be in danger of tipping over. HA! Actually Kwaj is a coral reef – not a seamount. There might have been a central volcano millenia ago, but it is long gone, the coral reef around it remains. Kwaj has an average elevation of 6 feet above sea level. I would be skeptical of the data presented above – where is the sensor? Kwajalein is a ring of dozens and dozens of islands, some tiny, some large, some with 1000s of people, some with none. There is still a lot of military activity there – I would doubt that the place is sinking. Coral reefs tend to adjust their height with respect to sea levels, so it will remain at around 6 feet above sea level regardless of the sea level. so it will remain at around 6 feet above sea level regardless of the sea level. Try again – coral does not grow above the water. Which brings up an interesting question – How old is the coral? It is those “hills” in the water Tim. I’m tellin’ you, the CAGW folks see them everywhere. Can’t fight their impeccable logic. That’s what I meant by a seamount atoll, a coral reef on top of an extinct volcano seamount. Given it is supposedly the largest coral atoll in the world, it will be old. Coral reefs tend to adjust their height with respect to sea levels, so it will remain at around 6 feet above sea level regardless of the sea level. Yes, but over vastly different timescales. Settling of a volcano will occur in short periods, as short as a few seconds in the case of a undersea landslide. Whereas coral islands adjust to sea level changes over hundreds of years. Volcano settling is often caused by earthquakes. There was a big quake in the Solomon Islands 2007 that seems to correspond with the spike up. Kwajalein is in the Western Pacific, an area of significant sea level rise as measured by satellites since 1992. The satellite measurements are independent of local settling of the adjacent land. In Florida…and beyond I would surmise, the Army Corps (at least that is the theory at the local level) decided to change sea level designations from NGVD (National Geodetic Vertical Datum) to NAVD (North American Vertical Datum)…in 2004. I have never really questioned the change until now. The sea level rose, across the board, anywhere from 8″-12″. We in the Construction industry were never given much of an explanation, and we were inundated with so many code changes…we never thought to question this change. Sea level just was “adjusted”…we complied. It is still thus! It makes me wonder the viability, and the source of such a massive change…and the timing. I was not a skeptical individual at the time…but I am now. anybody hep to this? Being a skeptic, I would like to see some data. July 31, 2013 at 3:39 pm: “…Kwajalein is a seamount atoll. An atoll formed on top of an extinct volcano. You can think of the volcano as a big pile of rubble that settles over time, lowering the surface of the atoll….” It is better to think of it as a cooling pile of (mostly) basalt that grows denser with time, and subsides back into the asthenosphere. It stays high while warm, but once the hotspot moves on, it is fated to sink below the waves. I suggest something else is at work here, or at least compounding the issue, like $$$. Kwajalein is in the Western Pacific, an area of significant sea level rise as measured by satellites since 1992. Nice try Eli. Why does the graphic end in 2008? We got 20 years of data but let’s skip the last 25% of it? Also, could you explain those areas in the southern hemisphere which are showing spots of +5 cm immediately adjacent to spots of -5 cm? How does that work? Try again – coral does not grow above the water. Beg to differ, I grow coral … my system mimics tidal gains and losses … the coral grows out of the water at the low ‘tide’ and right to the surface on the ‘high’ tide. Interestingly, Kwajalein appears to lie within the Indo-Pacific Warm Pool. There appears to be about 20 cm of sea level fluctuation* in the hottest part of this body of hot water (highest in La Nina times, lowest at the end of an El Nino?). It would be interesting to check sea level readings in islands inside and outside the IPWP to see what is going on. There could be a sea level decrease in some of those along the equatorial zone, but far east of the IWFP. If my surmise above is correct, that the Indo-Pacific Warm Pool is swelling, then we could be in for another big El Nino when the equatorial winds stop blowing. It is better to think of it as a cooling pile of (mostly) basalt that grows denser with time, and subsides back into the asthenosphere. It stays high while warm, but once the hotspot moves on, it is fated to sink below the waves. True, but I was explaining how sudden subsidence could occur. Earthquakes are known to cause rapid subsidence of land volcanoes, but I don’t believe it has been documented for undersea volcanoes. @Nils: What happened in 1998? Both graphs show a drop in sea level. If there are a lot of stroms with high waves, are the instruments being fooled? Can they be fooled by a lack of storms? Coral “sand” can be lifted above the sea level much as barrier island sand is lifted above high tide. So — are you both saying that, under a building, the coral will continue to grow and push the buildings even higher above sea level? I agree that a typhoon could create dunes from the coral sand, but I don’t think that coral is going to grow above the high tide level. Here is an interesting picture of plate boundaries, earthquakes, and sea mounts. Kwajalein is not near a plate boundary. It is almost halfway from the northern tip of Australia (2233 miles) and the Hawaian Islands. (2532 miles). Kwajalein is about 1140 miles from the plate boundary to the south, 1200 miles to the boundary to the SW near Papua NG, and 1400 miles to the Marianas Trench to the WNW. Majuro (shown in the Figure 7 plot near the end of the article, showing no sea level change), is 300 miles SE of Kwajalein. Hey, OT, but, wasn’t that dufus woman who thinks cold weather proves human CO2 causes global warming, interviewed in Germany in June, 2013 video, from The Marshall Islands? Brought over to parrot the party line, apparently. No, she was from Rarotonga (The Cook Islands). Since I like to hear arguments for opposing views, can you please comment on the reaction to this post by tamino, http://tamino.wordpress.com/2013/08/01/observe-closely/ ? Specifically, why did you only use a subset of the data for Majuro for your analysis, while using a much longer time period for Kwajalein? Also, the comparison of those data sets might be easier to make, visually, if you could plot the data for Majuro and Kwajalein in the same plot, or at least at the same scale. But I understand that it can be some extra work to replot the data. Also, the pdf linked as “a note from Anthony” is a report from 2002. I think I found the equivalent report for 2010, if someone is interested, http://www.bom.gov.au/ntc/IDO60025/IDO60025.2010.pdf . 3.9 mm/year sounds quite large to me (and it’s quite a bit larger than the slope in your figure for Kwajalein). What I try to say is that the way you visualize your plots, such as scaling, can give you the wrong impression of rates. I think this is especially the case when there is much noise in the data. Can you comment on this simple analysis? If I am not mistaken in my calculation, it doesn’t seem like the sea level at Majuro “shows a general […] stability”, and also there does actually seem to be a “general “rise””, at least not compared to the rate of sea level change for Kwajalein in your first plot. I didn’t try to calculate anything for the acceleration, since I’m not sure how to do that correctly, yet, so I can’t comment about that. Of course not. I haven’t been to an atoll, so I have to rely on my childhood summers on Long Beach Island and assume that processes are similar. Parrot fish munch on coral and create sand. Coral groes back, apparently to the mean high tide level. Mild wave action and tides bring coral sand out of the water and maintain the ring of sand around the lagoon, seamount, what have you. Wind blows the sand around, vegetation traps sand that blows into it. That’s one reason why dune grass is so important in dune restoration efforts. Bigger storms brings waves that reach that sand with enough force to move it away. On LBI my grandparent’s house was destroyed in a storm that breached the island in three places. If you build on an atoll in the Pacific, you’ve likely built on a seamount on top of dead coral and sand, and the seamount will be gradually sinking into the seafloor. I’d expect problems with dunes around the building and greater risk of flooding during storms. Like on coastal barrier islands, permanent buildings are a risky investment. Robert is right. Upward growth of coral atolls easily keeps pace with sealevel rise, but fixed infra-structures won’t. Hence permanent habitation with buildings etc. is not sustainable on these islands, irrespective of whether sealevel rise is man induced or natural. Most commenters, even Willis, seem to forget that. What an insanely cherry-picked Majuro graph. You do know that people can look up the lower levels prior to the ’90’s and the acceleration since 2010, right? NOAA Tides and Currents gives an estimate of error bars for tide gauge SL trends, based on length of record. For example, this is the link from the record for St. Petersburg, FL. NOAA states that a 20 year record length has an error of +/- 2.9 mm/year, which gives a confidence interval of 1.0 – 6.8 mm/year. This assumes that vertical land motion can be ignored (ho ho!). chris y: Thank you for the link! As I understand it, the estimate of error for a given record length given in your link is some mean value for all the stations considered in the referenced data. That would mean that there could be variations in error estimates for different stations. However, my error estimate for Majuro is noticeably smaller than the one you reference. Although this might be possible, when I redo the sam calculations for Kwajalein, my errors are only about half of what they report ( at http://tidesandcurrents.noaa.gov/publications/Tech_rpt_53.pdf ), and mean value is off as well. So it seems like I need to look into my calculations, and their methodology, to see where the differences come from. To call an atol an island is a mistake. A coral atol is a massive living structure, on a scale we find hard to recognize. The fringe that surrounds coral atols are about 6 feet above sea level worldwide, in spite of a rise in sea level of a few hundred feet over the past 20 thousand years. At the same time the atols themselves are sitting on top of massive volcanoes, that are sinking into the earth due to their weight and the plasticity of the earth’s crust, and the thinness of the crust at the bottom of the oceans. How do they achieve this? How do they manage to stay 6 feet ahead of the oceans? The secret is quite simple. Wave and wind action from outside the reef pounds the reef day and night and continually piles coral rubble towards the center, where it is bound up by vegetation to form the ring of small islands that fringe the atol. The atol is almost always accumulating the fastest on the side facing the prevailing winds, where the surf is the strongest The buildings and man made structures that sit on top of the rubble cannot grow the way the plants do, so eventually they must be rebuilt higher to remain above sea level. In the center of the atol there is a shallow lagoon, where there was at one time the peak of the volcano, that has long since sunk out of sight, and the resulting hole filled in by the coral rubble. Fresh water from rain that accumulates in the lagoon and forms a lens in the surrounding ring of islands inhibits the growth of coral in the lagoon itself, though it is not unusual to find “coral heads” that rise up from the bottom and present a hazard to boats. Many atols have a pass on the downwind side of the atol that has been carved over time by the action of the wind sweeping the fresh water out of the atol and in doing so inhibiting the growth of coral in the pass. Update to my previous comment: Okay, they make a number of corrections for Kwajalein, so they don’t calculate the same slope as I do, which probably accounts for all the difference. Willy Soon on sea levels. the graphic shows 1/2 the pacific rising and 1/2 the pacific falling. this is not sustainable. at some point in time the water from the higher 1/2 will flood back into the lower 1/2, forming a tsunami that will wipe out any land surrounding the lower 1/2. the entire west coast of the US will be lost. millions will die. however, that is only the beginning. the rapid change in mass distribution will throw the earth out of orbit and into the sun, leading to run-away global warming. With the temperature rising in the south pacific, it is no wonder that sea level is rising, after all, water expands as it warms. Ah ha! Go find that senator who thinks islands can tip over! He needs that graph for his next presentation! The 2012 NOAA paper by Leuliette “The Budget of Recent Global Sea Level Rise” reports that global sea level is rising by 1.1 mm per year with an error of 0.9 mm per year. The Kwajalein data needs to be audited, or at least checked by an unbiased outsider. There should be photos of dock pilings over the years that could be used as a sanity check. For example, the Arizona memorial was constructed in 1960. Comparing photos of the pilings to today shows no change in sea level in 50 years at Pearl Harbor. Is this really a post from N-A Mörner? It is very short, incomplete and as it seems at least to some extent, wrong. I have never regarded Mr Mörner as laconic. He usually likes to explain things to the detail. Nearly all Pacific atolls began their existence as reefs around volcanic islands. The volcanoes themselves generally began as mountains on hot spots, which are elevated. As the oceanic crust rides away from the hot spot the volcanism declines and the mountain – and the sea floor below it – gradually sink. The coral reefs continue to grow creating atolls as the mountain base and sea floor ride downward toward the abyssal plain. Everything is in motion and differentiating eustatic from isostatic changes is not trivial. Relative sea levels in the central Pacific have risen by about 100mm since the late 1940s. About half of this rise can be attributed to glacial isostatic adjustment, which is causing Pacific islands to subside at an average rate of maybe 1 mm/year. The rest is a result of meltwater addition or thermal expansion. The plot also shows the rate of SLR in the central Pacific accelerating after 1990, as it did in several other parts of the world. Globally, however, sea levels rose at least as fast if not faster in the 1930s and 1940s. Waiting to hear a response to Tamino’s http://www.weather.com/video/town-will-disappear-by-2025-38176. Aren’t y’all a bit embarrassed? … and drove sea level up at most western Pacific stations including Majuro and Australian (N and NW) stations. Majuro has a continuous GPS station – BOM/CGPS data shows no significant subsidence of station nor gauge over the entire record. 1. If up-to-date data (to last month) and a plot is available, why show a Majuro plot to end 2010? 2. Why blank out the last two grid boxes on the Majuro plot which is from 2012? Something to hide? Majuro data to last month shows a similar uptick to Kwajalein, and it also shows a downturn since the peak in 2011, following the SOI. SOI goes up and down; sea-levels in the western Pacific follow suit. Learn from it, and move on. radar. I even got to see a missile re-entry at night. Thanks for the Willie Soon video. In short, look around and take Dr, Mörner with a grain or two of sea salt. The sea level surface is not spherical. It is not even ellipsoidal. It is a complex surface defined in terms of tesseral harmonics of the gravity potential of the Earth. The gravity potential is a function of the distribution of mass, including that of seawater. If there are changes in the terrestrial mass distribution that alter the amplitude coefficients of the gravity potential’s harmonics, the configuration of the “lumpiness” will change. This can result in the potential going up by a few inches in one place and down by a few inches in another place, without changing the total quantity of seawater. Details, details…. Just by the nature of the name, I always thought Willie Soon was a Netherlander. Guess not. I looked at the NOAA web page (http://tidesandcurrents.noaa.gov/sltrends/index.shtml) and zoomed in on The Marshall Islands and if you click on Kwajalein you see 1.43 mm/yr riae and 3.60 mm/yr rise on Majuro. Looks to me like there is a rise for both stations as well as for almost all of the Pacific. A blue arrow downward show sea level drops and that is primarily along Alaska’s coast. If I were a Pacific Islander I would be concerned. Thanks for the Willie Soon video. Excellent! You should watch Willie Soon’s video for an explanation of the measurements. Hotels and tourists are heavy, man! […] In short, look around and take Dr, Mörner with a grain or two of sea salt. The sum of these components indicates a rate of eustatic sea level rise (corresponding to a change in ocean volume) from 1910 to 1990 ranging from –0.8 to 2.2 mm/yr, with a central value of 0.7 mm/yr. The upper bound is close to the observational upper bound (2.0 mm/yr), but the central value is less than the observational lower bound (1.0 mm/yr), i.e., the sum of components is biased low compared to the observational estimates. The sum of components indicates an acceleration of only 0.2 mm/yr/century, with a range from –1.1 to +0.7 mm/yr/century, consistent with observational finding of no acceleration in sea level rise during the 20th century. Well done to Willie Soon for covering sea level rise and doing an amazing job of making a few of the “specialists” look silly. Tide gauge sea level rise for the 20th century is about 1.7mm/yr. 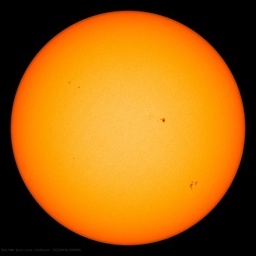 For the satellite record (1992 – present), it is 3.1 mm/yr (or 2.8 without glacial isostatic adjustment). From my reading of the recent literature, there is at best moderate certainty about recent acceleration (global, not local). Nice try Eli. Why does the graphic end in 2008? We got 20 years of data but let’s skip the last 25% of it? A fair point, but it can equally be applied to Morner’s – rather brief – analysis, which only goes up to 2010. Include recent data and there does indeed appear to be accelerated sea level rise at Majuro. But I’m skeptical of claims of local trends at such short time scales. I’d like to see a proper analysis with all data and confidence intervals. I hereby politely ask Morner to try again with the recent data, and to show the results he gets with uncertainties. Off to see if Tamino did that. The satellite sea level is a story of post-hoc adjustments which result after each adjustment in increased sea level rise. Therefore I think Dr. Moerner is right when he says sea level rise 10 cm +-10 cm is the possible prognose for 2100, as per your link, and what is above is simply nonsense. 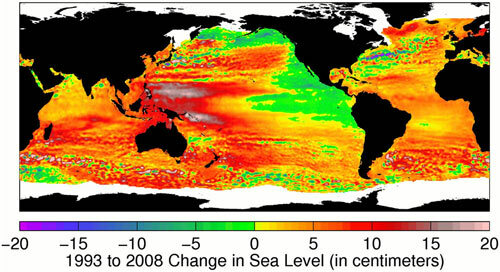 Global Sea Levels are rising. Not sure why you bother cherry picking one location. They do not – you’re conveniently missing out the GIA adjustments – when taken into account, the figure (bottom right) is 1.936 mm/year. Satellites don’t “see” relative sea-level, but absolute sea-level. Also, it’s invalid to compare any tide-gauge trends which don’t match the satellite date range exactly – to do otherwise (as Mörner does) is to compare apples and oranges.